A few readers have asked how we manage to eat wild mushrooms without killing ourselves. 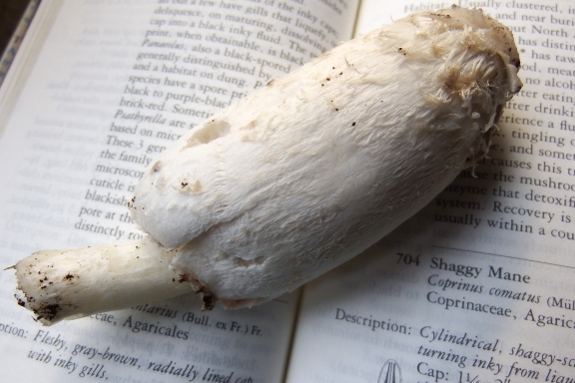 Since we added a new species --- shaggy mane --- to our repertoire this week, I thought now would be a good time for some fungal wildcrafting tips. First of all, when I'm out in the woods, I only select the really easy edibles, species that are awfully hard to confuse with anything poisonous. After reading a few mushroom books and websites and hanging around with mushroom hunters, you'll hear the same names pop up over and over. Morels, oysters, chicken of the woods, hen of the woods, chanterelle, lion's mane, shaggy mane. These species are all pretty unique and have few or no poisonous lookalikes. You'll notice, though, that I steer clear of even prime edibles that are just plain old gilled fungi since they're too easy to confuse with deadly species like amanitas. After finding one of these easy mushrooms, I bring it home and look it up in at least two sources. I have three mushroom field guides on my shelf and the internet offers many additional photos and descriptions. There, I learn warnings, such as the shaggy mane's ability to make you sick if you're consuming alcohol that day or chicken of the wood's requirement for thorough cooking. At the same time, I check distinctive field marks. In this case, Mom and I had seen an older shaggy mane in the same spot Friday that was mature enough to be disintegrating into the typical black goo. Finding a younger mushroom that looked the same a few feet away and a few days later made this a pretty safe ID. In the end, I feel like harvesting your own edible fungi using this method is actually safer than eating store-bought food. I've wildcrafted quite a few mushrooms and have never gotten sick, while I've had food poisoning from off-farm food multiple times. 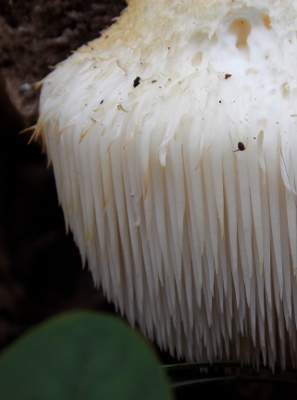 So which is really more dangerous --- eating a shaggy mane or buying that hamburger from McDonald's? ...or Chipotle the poster child of "healthy" fast food. The food supply chain is too long with too many links, it's no wonder people get sick. Chipotle is now closed in Oregon and and Washington until they find out where the e. coli came from. I agree the homestead is a much safer food source. For our wedding rehearsal dinner we had an amazing "wild mushroom soup" made from local wild mushrooms. I've not had anything mushroom as good since. Or property is LOADED with wild mushrooms. Would you mind sharing your favorite mushroom books? I'm seriously terrified of killing myself in an attempt at mushroom identification. I have to step in here and defend Chipotle. Notice they didn't close any OTHER Chipotle's in the country? Their food chain may not be perfect, but it's much more local than any other fast food place. I guarantee McDonalds would've recalled (they'd never close) from all over the country, instead of just two states. So that tells you that that burrito from Chipotle's I'll be (happily) eating this weekend in North Carolina does NOT get ingredients from California or Oregon. Much better than the average bear. Obviously, they still serve vegetables in the winter, so they can't get EVERYTHING locally sourced, but in 2013 will used more than 15 million pounds of local produce. As much as I would love it, we can't all live like Anna and Mark, (my husband is just not a farmer, lol), but companies like Chipotle that are doing their best to be more sustainable. Nita and Emily --- Now, now. No fighting over Chipotle. Mushrooms Demystified --- I like the fact that this book is written by an edible mushroom forager. It's a little less handy to me because it has more of a western focus, but many of the species are the same on the eastern half of the continent. It's also pretty technical --- a bit beyond my ken, really. But I like books I can grow into. A Field Guide to Southern Mushrooms --- This was a hand-me-down a few years ago, so I'm still feeling it out. So far, I just use it as a backup to show me an extra picture or two of a mushroom I've ID'ed somewhere else. As you can tell, I'm a field guide connoisseur. That said, I haven't researched mushroom field guides in over a decade, so I like to think something better might have come out in the interim. If so, I hope you'll post and let me know! Okay, I couldn't resist --- I went and researched mushroom field guides. I think that if I were buying books today, I'd try out 100 Edible Mushrooms, since my specific focus at the moment is culinary. 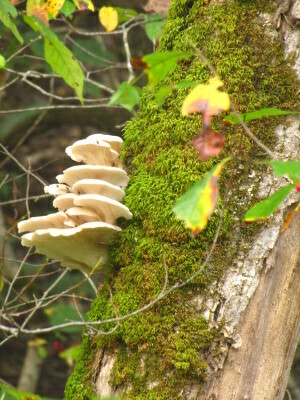 That said, if I were choosing just from a sense of wonder about the outdoors (which was my original focus), I'd probably nab Mushrooms of West Virginia and the Central Appalachians because it's nearly specific to where I live, is by a University Press, and is huge. That would be a real mushroom book to grow into. All of that said, the reviews on Amazon seem to suggest that Mushrooms Demystified and the Audubon Guide are still the top choices for most fungiphiles.